Denis Dale rounds up all the latest senior amateur golf action from around the country. 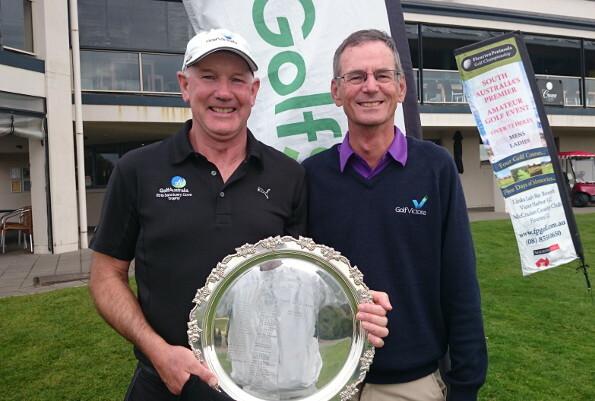 VICTORIAN senior Greg Rhodes continued his rapid climb up the Australian Senior Ranking System with an impressive victory in the 2015 Grange/Kooyonga Senior Open. Rhodes had rounds of 75 on both the Grange East and Kooyonga courses to total 150 and defeat a very good field by six strokes. Earlier this year Rhodes won the NSW Senior Amateur Championship with a record score of six under par and in July represented Australia in the matches against New Zealand. He currently sits in second place on the national ranking behind fellow Victorian Gordon Claney. Second place in the Grange/Kooyonga event went to the remarkable NSW senior Vince Clark with rounds of 79-77=156. Getting closer to 70 years old Clark’s form in the past twelve months or more has been outstanding and he is clearly the top rated Over 65 senior golfer in Australia. Third place saw a four-way tie between a trio of Victorians in Ian Frost (84-73), Gordon Claney (82-75) and Mick Streit (73-84) alongside South Australia’s Wayne Humphries (77-80). THE 2015 South Australian Senior Amateur Championship was played over 54 holes at the testing Links Lady Bay Golf Club. There was an excellent field for this championship and they all enjoyed the challenge of this wonderful links style course. The winner was Victorian Ian Frost after an exciting final round that included a playoff. Holding a three-stroke lead overnight Frost fired a final round of 76 that included four bogies and fourteen pars. While he was playing very steady golf his fellow Victorian Gordon Claney was on fire with seven birdies in his round of three under par 69 to finish in a tie with Frost. The play off hole was the ninth, a very solid par four playing back into the breeze. Both parred the first time with Claney making a good up and down from the front right of the green and Frost making a solid two putt. The second time both hit the green with Frost almost in the exact same position and he putted first – a good putt but not in the hole. Claney gave his shorter birdie putt a reasonable look at the hole without dropping. Both parred the hole so back to the tee. The third time around Claney had a poor lie just off the fairway and found the greenside bunker with his approach. Frost played to the front edge and lagged his putt to inches from the hole. Claney came out of the bunker well but when his putt slipped by the title belonged to Frost. NSW senior Chris Gordon finished in third after a countback from local Nigel Turner and the defending champion John Banting. Joseph Scopacasa (Grange) was the clear winner of the 54-hole handicap section with a total of 210 defeating Rod Phillips (Royal Adelaide) on 217. AFTER a slow start to his season Twin Creeks senior Denis Dale has taken over the lead in the 2015 NSW Senior Order of Merit competition. Dale has been in excellent recent form with three wins and three second places from his last eight starts and this has moved him ahead of long time leader Dale Tapper (Bayview) and regular top line performers Greg Stanford (Mona Vale) and Ross Bockman (Long Reef). Dale will be looking for his ninth title in the ten-year history of this event. At the time of writing there were fifteen events remaining including the 54-hole ACT Senior Amateur Championship that carries 400 points to the winner. Results from this event could well decide the 2015 NSW Order of Merit winner. 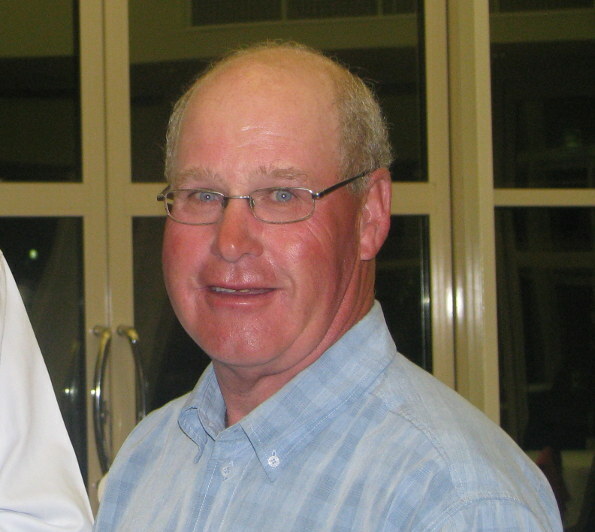 Local member Paul Day showed his class with a narrow win in the 2015 Kooindah Waters Seniors. Day enjoyed playing on his home course that was presented in great condition with the superb greens perhaps the best played on this year. After a few years of bad weather it was pleasing to have perfect warm weather to enjoy this quality course. Day had a round of three over par 75 to edge out Richard Greville (Magenta Shores) and Denis Dale (Twin Creeks) by a stroke. Day’s round included two birdies and two double bogies. In fourth place was Long Reef senior Ross Bockman with a round of 77. The Over 65 section went to Jim Hogg (Cessnock) who defeated local Rob Steele on a countback after both players had returned rounds of 83. The 2015 Newcastle Golf Club Seniors began with a continuation of the heavy rain that had fallen the preceding day. The large field that gathered were wondering if there would be any play at all when miraculously the rain eased, the sun appeared and the players made their way out for the shotgun start. The greens were certainly heavy and many players struggled with the putter but overall the course was in very playable condition. Any chance to play this wonderful course (rated in the top twenty in Australia) should always be taken. At the end of the day there were three golfers in a tie for the lead after four over par rounds of 76. The player’s were Mona Vale’s Greg Stanford, The Lakes’ Vince Clark and Waratah senior Leigh Anthony. The winner after the countback was Stanford with Clark receiving the runner up prize and Anthony third. The next best round of the day was a 78 by Twin Creeks’ senior Denis Dale and he was the winner of the Over 65-years scratch from local member Stephen Docherty who finished with a round of 79. The overall net prize went to Michael Coughlin (Newcastle Golf Club) with a net round of 70. He edged out Cabramatta senior Chris Collins by a single stroke. This event was once again generously sponsored by local retirement village, The Cove. The prizes were in excess of $2,000 and the large field did appreciate both the sponsorship and the work of the Newcastle club in hosting the event. PERHAPS the most anticipated week in the year-long Doug Bachli (scratch) and Paul Lulofs (handicap) Order of Merit competitions is the week now known as “Sandbelt Week”. The opportunity to play on many of the best courses in Australia in one long week of golf attracts senior golfers from all states and 2015 was no exception. The week began with the 2015 Yarra Yarra Seniors and the field comprised of some of the home states finest senior amateur golfers along with interstate visitors from New South Wales, ACT, Queensland, South Australia and Tasmania. Huntingdale’s Mick Streit returned the day’s low round of four over par 76. Streit’s consistent play of 38 on the both the front and back nine’s in cool and breezy conditions saw the plus one marker take home the ‘Ray Barned’ title for 2015. The Metropolitan’s Paul Bray finished in second place just two shots off the pace after a solid round of 78 with Yarra Yarra member Guy Krall finishing third with a round of 79. In the nett event, Yarram’s Ignatius Duivenvoorden finished the day with the top nett round of 74 from a daily handicap of 11. The defending Paul Lulofs champion snuck home by a stroke from NSW visitor Ross Manton (Castle Hill) who finished second on a countback with a nett 75. 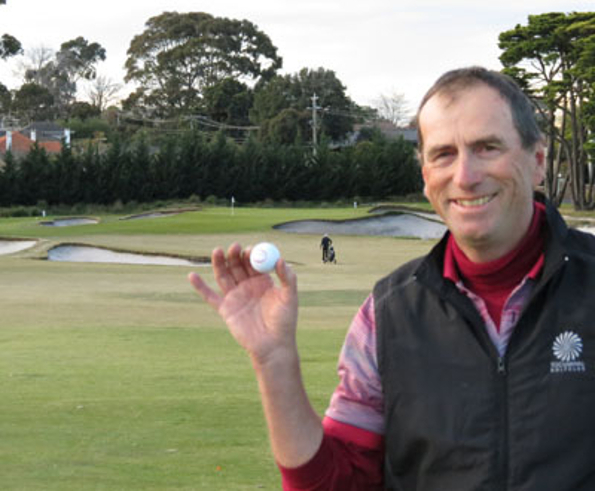 The following day Ian Frost (Bendigo) claimed the 2015 Kingston Heath Senior Amateur with a fine round of 75 (3 over). Beginning on the 10th hole, Frost played consistently in the difficult conditions with a highlight being a birdie on the tough sixteenth hole. Next event was the 2015 Victoria Golf Club Seniors where the highlight was not the winning score but a hole-in-on on the opening par four by Rossdale’s Kerry Boehm. After the game Boehm reported that “a smooth 3-wood with wind assistance” was all that was required for him to have his fourth career hole in one. Not surprisingly, this was his first on a par four. In the main event of the day Greg O’Brien from the Howlong Golf Club in New South Wales snatched victory by a single shot. O’Brien fired a 4 over par score of 76, to take the title from Kingston Heath member Gordon Claney on 77. In the nett section, a countback was required to separate two interstate players, with Rod Fraser (Monash, NSW) coming out on top ahead of Neville Hewett (Yowani, ACT) with both players returning nett scores of 72. 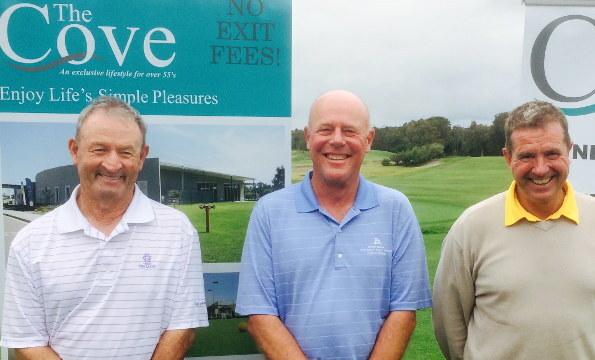 The fourth event of the 2015 August Sandbelt Seniors week was played at the prestigious Royal Melbourne Golf Club. Gordon Claney (Kingston Heath) made another appearance at the winner’s lectern after defeating senior newcomer Mark Abeyarante (Peninsula-Kingswood) on a countback. Both players had carded scores of three over 75. In the nett, Rod Fraser (Monash, NSW) continued from his winning form at Victoria on Wednesday as he fired a nett score of 70 off his handicap of 7. As per usual, the golf course was in tremendous condition and was admired by all. Numerous players mentioned their pleasure at having access to one of the greatest courses in the world. After watching Jason Day’s inspiring victory at the PGA Championship, 81 players were revved up to compete at this years’ Metropolitan Plate. The morning started quite cold and wet but the skies soon cleared up with only patches of sprinkling rain at various times during the day. Gordon Claney of Kingston Heath produced an outstanding two under par front nine and a one under par back nine to finish with a round of 69 to take this years’ top honours. Claney, who finished runner up in this event last year, made it two wins in a row after his victory at Royal Melbourne. Michael Doutch (Woodlands) had the unusual position of breaking par in a senior event and finishing two strokes from the winner after his round of 71. Mick Streit from Huntingdale finished third with a score of 76. In the Handicap section Michael Doutch was rewarded with the top prize with a great nett score of 70 from his one handicap. Box Hill’s Gary Cornish was next with a nett score of 71. The last event of the August Seniors Week teed off in the 2015 Commonwealth Golf Club Seniors. A good field of 77 enjoyed calm but chilly weather at this championship course. 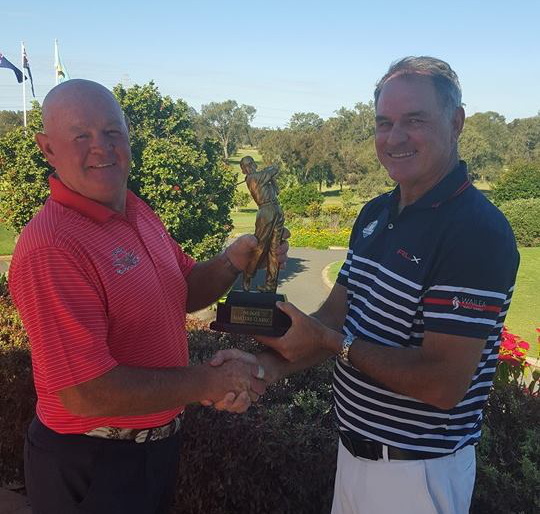 It was again Kingston Heath member Gordon Claney who won after a round of two over par 75, to win by one stroke from Guy Krall (The National). Claney was coasting at two under after 13 holes before a triple bogey on the sixteenth put a bump in his round. A lengthy par saving putt on the last was good enough to take the title. This made it three in a row for Claney with his earlier wins at Royal Melbourne and Metropolitan. In the handicap visiting West Australian Steve Langoulant (Mt. Lawley) had a respectful round of nett 72 off his handicap of 8 to win on a countback from the wily Victorian veteran, Pat Giles. THE senior golfing community will be pleased to know that Golf SA have announced that the two medals within the South Australian Senior Order of Merit will be named in honour of two stalwarts of senior golf. The South Australian Senior Order of Merit Medal will be named after John Beaumont who passed away in late 2014. John was based in the state’s southeast playing for many years at Millicent golf club before transferring to Mt Gambier. A reserved and quiet person John was a determined golfer. He loved golf and travelled many times with his wife Maree in their caravan playing in east coast senior events. John was a top-level senior golfer known for his consistent play and length off the tee. He represented Australia from 2009-2012 in the Sanctuary Cove Trophy against New Zealand and was a member of the winning 2010 Australian Asia-Pacific Championship team in Thailand. In 2010 he won the Queensland Senior Amateur Championship, the Grange Senior Open and finished second on the Australian Senior Ranking table. Whilst he was never able to win his home state’s senior title he did finish a close second to Peter King in 2013. The South Australian Super Senior Order of Merit medal will be named after Tony Mazzone who passed away early in 2014. Tony had been a long time member of Grange Golf Club where he represented the club in pennant golf for many years before taking to the then fledging Australian senior golfing tour he helped develop in the early 2000’s. 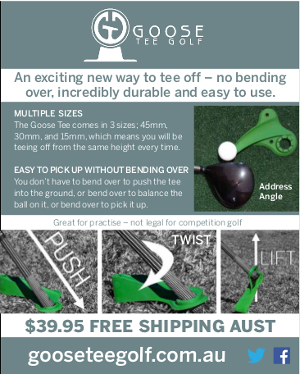 Tony was a talented golfer and won the South Australian Senior Amateur Championship in 2001 and 2004. He also gained selection a number of times in the Australian Senior team that played the Australian Defence Forces. Tony had an extremely generous nature and many times assisted in the promotion of senior golf tournaments, usually insisting there be no recognition of this generosity. He is also remembered for his strong support of junior golf at Grange. Both were gentlemen and are sorely missed within the golf community for their play, their friendship and their personalities. They will not be forgotten with the naming of these prestigious medals in their honour. The Senior Pennant began in late September with sixteen clubs competing over two divisions. The majority of Adelaide metropolitan clubs are competing and they will be joined by the Mt Barker, South Lakes, Victor Harbour and Gawler clubs. The competition will again be strong with all clubs looking to stop the run of Tea Tree Gully who will be attempting to keep their record in tact with a ninth straight win. Monday 24th August saw a new senior order of merit event being added to the South Australian calendar with the 18 holes Glenelg Senior Amateur. This is one of Adelaide’s premier clubs and the response was excellent with a field of 58. The course was in first class condition with the only “problem” being a very cool day and high winds. The greens were firm and fast and with the wind blowing strongly from the south, putting was a real challenge to say the least. Winning the inaugural Glenelg Senior Amateur was Tea tree Gully’s Norm Cordina with a fine round of 77 in the testing conditions. Cordina won by seven strokes from Steve Ross (South Lakes) and Glenn Smith (Flagstaff Hill) who returned rounds of 84. Peter Bywaters (Victor Harbour) won the Super Seniors with his round of 84 while the handicap prizes went to Tony Smith (Flagstaff Hill) and John Reynolds (Grange). The efforts of Glenelg to put the event on were appreciated by all and everyone looks forward to continuing the challenge of Glenelg in 2016. THE 2015 Gailes Seniors attracted a good field with the winner being local member Leigh Madsen with a good round of 73. He defeated McLeod member Tim Deakin by two strokes with another two strokes to another local member, Peter Duncan. Matthew Kim won the men’s handicap with 38 Stableford points and Mok-Kyung Han the women’s section with 34 points. Pacific Harbour is one of the best tests of golf in Queensland and the field of senior golfers for the 2015 Pacific Harbour Seniors did find the course a real test. The winner was the only score under 80 with local member Peter Gwyther finishing on 79. Timothy Deakin (McLeod) and Lindsay Brown (Keperra) tied for second place on 80. Paul Murray (Oxley) took out the handicap section with 35 Stableford points and Adrienne Naismith the women’s with 34 points. The 2015 Nudgee Masters was played over 36 holes and the winner of the men’s scratch championship was Nudgee member Steve Rowley with two excellent rounds of 72-70 for a 36-hole total of 142. Rowley was a dominant winner with a winning margin of seven strokes. Coolangatta Tweed Heads senior Phil Towle finished in second place and was the winner of the Over 60 section with rounds of 72-77 = 149. Josie Ryan was the winner in the ladies section with very good rounds of 81-80 = 161 to defeat Cheryl Sternberg (81-84) by four strokes.